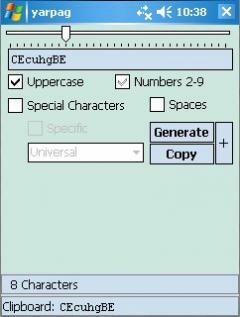 yarpag-sd - This handy Windows CE utility generates random passwords based on user-selectable criteria. NOTE: You can increase the random seed entropy by either moving the mouse pointer around on the form for a while, or generating a bunch of unused passwords, before creating the one you are actually going to use. Out of the box, yarpag-sd will generate passwords containing both uppercase and lowercase letters, plus the numbers 2 through 9. The latter was chosen as the default setting to avoid confusing zero with capital 'O', and one with lowercase 'L'.